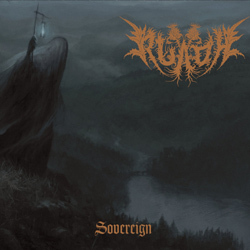 Atmospheric black metal project Ruadh from Glasgow, Scotland will release its debut full-length album “Sovereign” on April 12th, 2019 via Northern Silence Productions. Ruadh (which is pronounced “Roo-Ah” and translates to “red” ) is the solo project of musician and songwriter Tom Perrett. Tom was born and raised in one of the oldest Burghs in Scotland, which translates to “The red glen”. The derivation of the name of the town is unclear, but one theory is that the area was once a settlement of Reuther, an ancient king of the Scots, who ruled between 213 and 187 BC. Drawing from the vast well of history, culture and mythology, Ruadh set out to compose music purely to taste, creating an unmistakable atmosphere with the beating heart of old school black metal favourites of Tom, such as Windir, Bathory, Burzum and others, which should also appeal to fans of Saor, Winterfylleth, Panopticon and similar acts. “Sovereign” will be released on CD as collector’s edition in digipak, limited to 1000 copies, already available for pre-order in their label’s web-shop.